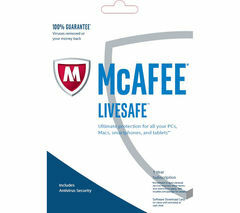 When you want the best protection around, install McAfee antivirus on your PC or Mac and rest assured you’re protected. Going online needn’t be a risk if you take the proper precautions and use McAfee internet security. Clicking on a malicious link or website can ruin your day, and the last thing anyone needs is to have to take your laptop into the shop because it has a virus. 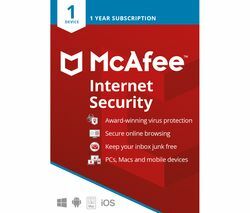 Fortunately, you can prevent your desktop PC or laptop from becoming infected when you’re protected by McAfee antivirus and McAfee internet security. Whether you run a business or you simply want to protect your notebook when you go online, McAfee internet security will keep you safe, even if you let your guard down and accidently click on an untrustworthy link. McAfee antivirus is used by multinational corporations and home users alike because it works tirelessly to keep you protected. Make sure you check our full range of internet security options, including our range of Norton internet security packages. Whether you run a business from home or you simply want protection for your personal laptop, McAfee antivirus will keep you safe when you’re online.